Most activity on Foro achoLove is public, including your profile information mentioned above. You also may choose to publish your location in your profile. Information posted about you by other people who use our forum may also be public. For example, other people may mention you using @nickname in posts. We provide certain features that let you communicate more privately or control who sees your content. For example if forum admin is enabled, you can check the "Set Topic Private" checkbox when you create a topic or click on the "Private" button of your topic first post, or use the Private Messages to have non-public conversations. In these cases we will store and process your communications and information related to them. This includes message content, images, information about whom you have communicated with and when to better understand the use of our community, to protect the safety and review the reported messages. We share the content of your Private Messages with the people you’ve sent them to; we do not use them to serve you ads. When you use features like Private Messages to communicate, remember that recipients have their own copy of your communications on Foro achoLove - even if you delete your copy of those messages from your account - which they may duplicate, store, or re-share. 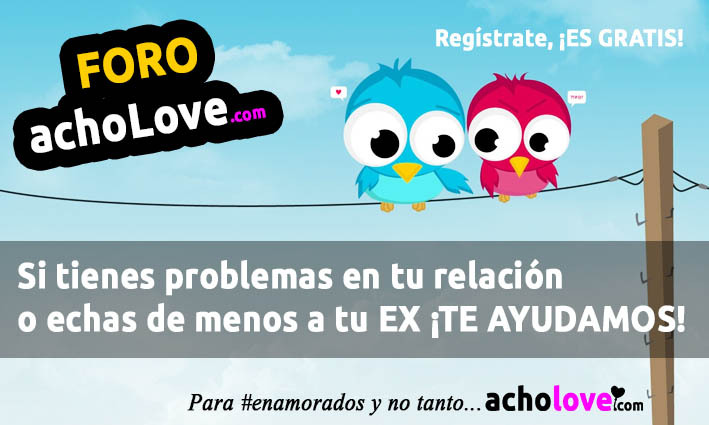 Foro abierto para tus problemas y tus dudas de amor. NO estás solo/a. Si te gusta un chico o una chica y no sabes que hacer en nuestro foro de amor te ayudamos a que tengas la mejor primera cita del mundo. Si no sabes que decirle a esa persona que tanto te gusta o te pone también te ayudamos. Si la relación de pareja cada vez va a menos no te preocupes, nuestros usuarios del foro de amor están aquí para ayudarte. Solo tienes que registrarte y dejar un mensaje en el foro que más se adapte a ti. ¡Simplemente un foro de amigos, un foro de novios/as o un foro de ex parejas! Si quieres leer nuestro blog antes de publicar en el foro, eres bienvenido/a.